My Chin Can Kill is a delightfully irreverent, yet oddly touching, epic of ambition and disappointment, fame and anonymity, and lots of fake blood. Told in Bruce's wry, sarcastic voice, it is a "Hollywood from the bleacher seats" look at his experiences in film and TV and at his status as a cult horror and sci-fi movie god. This man with the face of a matinee idol and the heart of a Three Stooge first attracted what has grown into an enormous cult following as the star of Sam Raimi's legendary Evil Dead trilogy of thriller-comedies. 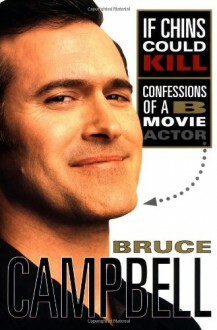 With tireless good humor and biting wit, Bruce acted, produced, and directed his way through a baker's dozen of "B" horror films and space operas before finally enjoying mainstream stardom on prime-time TV. Deeply earnest and fiercely funny, this book tells the story of an unlikely star who continues to lead a unique double life as cult movie icon and regular Joe. Love it. Listened this one on audio and it was very cool to hear Bruce read his book (with the occasional update). I am a big fan of Bruce’s movies and it was cool to hear him talk about some behind the scenes stuff and how him and some of his friends, like Sam Raimi, got started.